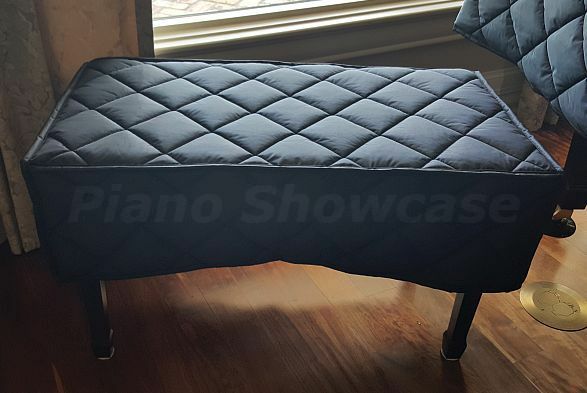 Protect your Piano Bench with a Bench Cover. MACKINTOSH FABRIC is manufactured of heavy cotton drill cloth, in a matte finish fabric bonded with a rubber compound, and has a flannel underside for soft contact with the bench finish. These covers are exceptionally tough and durable and are well suited for schools, studios, hotels, churches or anywhere that has heavier traffic. Black Or Brown...Prices are as listed. VINYL FABRIC - Made of the 'finest quality' thick durable fabric. Made with a soft fleece lining to protect the finish on your bench. For protection in areas where liquids may be spilled, (just wipe off any marks). CLASSIC QUILTED - Water Repellent - Black nylon quilted fabric. Quilted in 4" squares with 100% soft poly-cotton flannel backing to protect the finish on the bench. TOP OF THE LINE/PREMIERE QUILTED - Water Repellent is 1/2" thick, Black nylon quilted fabric. Beautifully quilted in 4" squares and the backing is 100% soft cotton flannel to protect the finish on the bench. The extra thickness will give more protection. QUILTED PADDED MACKINTOSH This 1/2" thick, strong padded Mackintosh fabric is manufactured of heavy black drill cotton in a 4" square quilted design and has a soft cotton backing to protect the piano's finish. All of these bench covers are custom-made, therefore no returns. Please note bench covers will be made 1/2" to 1" larger to allow for ease of placement and removing. If you don't see your bench size listed, we will just type your bench measurements in the "Custom Size" box below. Custom sizes are priced at .18¢ per square inch. plus any extra for the fabric you select. (Please note that our shop cannot calculate the price of custom sizes. You can get your price by multiplying the width x length then multiply by .18¢.) For example: 15" x 32" = 480 sq. in. x 18¢ = $86.40. For Artist Bench Covers please provide Width & Depth, and the skirt Length in the field provided in the checkout. Please remember to add the extra inches in the width, for the 2 Adjustment Knobs. You must provide dimensions for all artist and custom bench covers. I ordered a cover for my Jansen piano bench. I was shocked both with how quickly I received the cover, since it was a custom order. It was about a week from the day I ordered the bench until it arrived. The quality of materials and work is excellent. I will very happily recommend these to my colleagues and students! I am very pleased with the piano and bench covers. I only wish I had know about them 18 years ago. My piano sits by a large window and unfortunately has had some sun damage. These covers would have prevented that. I ordered a custom cover for an artist's bench and expected it to take weeks to arrive. To my delight, it arrived much more quickly than I could have reasonably expected, and it met the specifications perfectly. We received the cover very quickly. It is very nice and comfortable for our pianist; she has to sit for extended periods of time for rehearsals and appreciates the padding. Just what I was looking for and came much quicker than expected. Oddly, the bench cover arrived before the email telling me it shipped. Very satisfied customer here.